(ISFAP) – what does it do? Who is in charge? ISFAP has identified that the needs of the economy require certain critical skills if the country is to achieve higher rates of economic growth to reduce the triple challenges of poverty, unemployment and inequality. Nxasana says “unlike other student funding models, we are committed to using our strategic intent of SHARED VALUE to connect all stakeholders of our economy to produce a high calibre of skilled young people who are geared up for meaningful participation in the economy,” adds Nxasana, speaking on ISFAP commitment to supporting students that will shape the future of South Africa’s economy. “The 4th Industrial Revolution is upon us; coming to the fore with Artificial Intelligence, Robotics, Blockchain and Social Media. We are working with companies to assisting in training students for occupations of high demand that will be useful in the future,” he says. ISFAP is funded by both private and public sector entities and has worked closely with the Department of Higher Education and Training (DHET) and Department of Trade and Industry (dti). 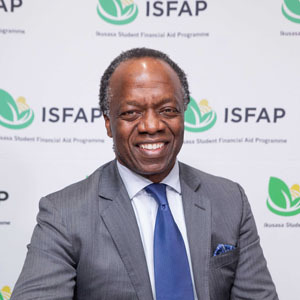 The Ikusasa Student Financial Aid Programme (ISFAP) has hosted a successful Recognition Dinner, honouring their bursars, funders and donors who have assisted them in funding tertiary students in the year 2017 and 2018. The dinner was attended by senior executives of distinguished companies such as their founding members – Business Leadership South Africa (BLSA) , The Banking Association (BASA), the Association for savings and investments South Africa (ASISA), FirstRand Foundation (FRF) and the South African Institute of Chartered Accountants (SAICA) and other professional bodies who are the financial engines behind the institution, ensuring the success of the vision ISFAP has for disadvantaged and missing middle students. The event was also graced with the attendance of students who benefit from the ISFAP funding; Ian Stols and Monni Cordelia Makhwiting from the University of Pretoria as well as Nokuthula Khwasha. The students shared their experiences of the programme with the donors and funders, expressing how ISFAP has helped them in the pursuit of their dreams.